Great lyrics and singing Bob D.; who is not one to encourage his lyrics to be pinned down . To dig deep into the last verses Bob sings about Judas Iscariot , whom Christians know was the Disciple to betray Jesus with a kiss. However , “what is written “Jesus said “shall come to pass “. “Think for yourselves “, sings Bob “. I can’t think for you “? Who is Judas really…a close Disciple… or a sinner to God ? Is God always on America ‘s side for wars ? Dylan as always, the consummate writer of abstract lyrics , whose songs we try to immortalize , as we do with the Bard himself. What a cross to carry ! Very hesitant indeed. Wonder what was on his mind? One worry in Dylan’s mind might have been the audience reacting to the lyrics being sung to the almost-unchanged melody of “The Patriot Game”, itself from an earlier traditional tune “The merry month of May”. 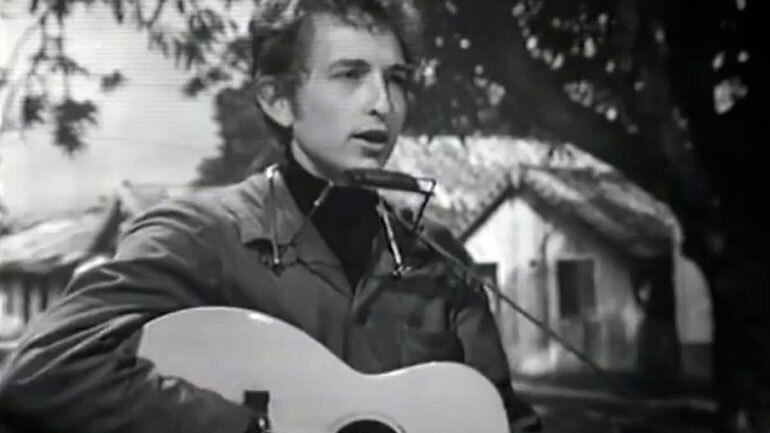 As we know, Dylan was at the time in the midst of creativity and controversy, lifting inspired storylines for lyrics and traditional melodies for new songs. Other prominent examples include “Blowing in the wind”, “Masters of War”, “Gates of Eden”, “It’s alright, ma” – all of which caused speculation and noise around a defensive Dylan.